On Saturday the second of my two charity concerts this year took place in St Andrew’s Church in Sheffield and I’m delighted to announce that £714.58 was raised for Marie Curie Cancer Care. The concert opened with Boyce’s Symphony no. 1 and a joyous sound from the string orchestra under the baton of Robin McEwan. 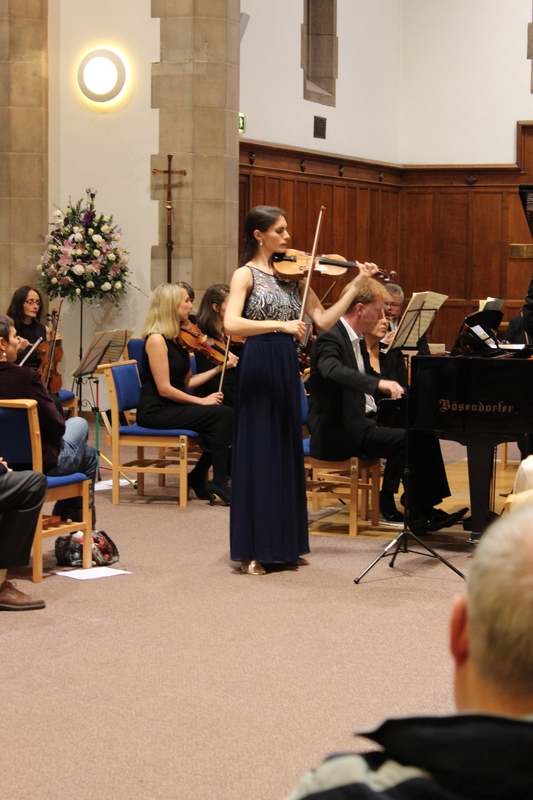 I then performed Mendelssohn’s Concerto for Violin and Piano with the wonderful Tim Horton (pianist in Ensemble 360 and the Leonore Piano Trio). This work, composed when Mendelssohn was only 14, was new to many members of the audience, but several commented that it ought to be better known. After the interval and a chance to enjoy some delicious cupcakes the fabulous Abbeydale Singers took to the stage and treated us to some more Mendelssohn in the form of his Four Sacred Part Songs. It is always a pleasure to hear the choir perform, especially in such a beautiful acoustic. The orchestra then concluded the concert with Dvorak’s wonderfully atmospheric Nocturne for Strings and the rousing Capriol Suite by Peter Warlock. This is the largest event I have organised to date and, although there were stressful moments along the way, it was all worth it for the amazing experience and to be able to give so much money to such a great cause. Many thanks to all the performers and those who helped behind the scenes and of course to the audience for supporting the event. This entry was posted in Uncategorized and tagged Abbeydale Singers, Charity concert, Marie Curie Cancer Care, Mendelssohn, Robin McEwan, Sheffield, St Andrews Psalter Lane, Tim Horton. Bookmark the permalink.